Patterns are paper templates for all the components of a garment, such as cloths, lining, interlining which have to be cut for a garments. These patterns are used to draw sketch on cloth or marker paper. Block pattern or basic block indicates the original pattern. Block Pattern is made based on the specific and standard body measurement without any design or style. It is produced according to exact dimension of body for different age group and gender. i. 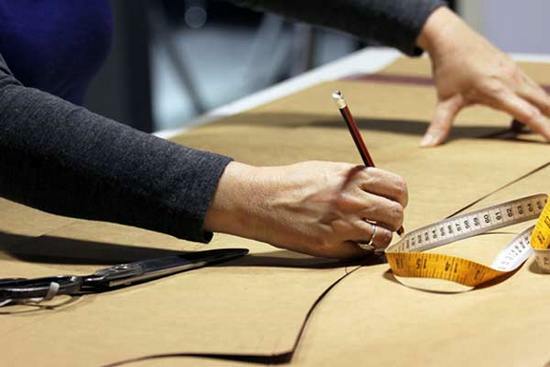 Flat method: In this method, different parts of garments, specially major parts are made by technical drawing. In the technical drawing, proportion of different parts of a garment is considered. This pattern can be made by both manual and computerized method. ii. Modeling: It is primary and first method and widely used in garment industry. Block is made with standard body measurement of mannequin. This block is called toile. Toile is worn on the mannequin and adjusted the pattern necessarily. Then Toile is worn out from the body and individual parts of Toile are drawn on hard paper. Working pattern is derived from the flat method or modeling. Each and every pattern is laid on the board paper to copy the block pattern. Then sewing allowance, Trimming allowance, Button hole, button attaching, dart, pleat, Notch, shrinkage of the fabric, etc are added with the copied pattern. Working pattern are needed for each an every part of the garments. Working patterns are then cut with a sharp scissor or knife. Garment size and name of the parts are written on the pattern pieces. Sample garments are made from the working pattern. Grading means the step wise increase or decrease of a master pattern piece to create larger or smaller sizes. The starting point can be the smallest size or the middle size. Grading alters the overall size of a design but not its general shape and appearance. Computer aided grading systems utilize internal calculation algorithms (grading rules) for pattern construction. The desired range of sizes is created one by one using a pattern template. Marks are made around the master pattern at the appropriate distance and the marks are later joined up to form the enlarged pattern. In this way a full set of templates, the pattern set is generated. A Grading machine eases the task of creating the pattern set. The device grips the master pattern and displaces it by a precise vertical and horizontal distance, after which the appropriate edge can be traced. The patterns can be cut out and can be used to make marker manually, if necessary. The graded sizes can be stored in the model files of the computer and recalled when cutting markers for that style are to be planned on the system. The grading increments are fed in to the computer and the different sizes are generated automatically using the same method as applied for manual Grading. The pattern for each individual size is calculated separately starting from the data in the size charts. The resulting layer of the patterns can be displayed to scale on the computer monitor for visual assessment and if necessary adjustment. Once the pattern set has been generated on the computer, it may be used in various ways, depending on the level of automation in the factory. In a fully automated system, the garment parts will be sorted automatically and arranged in to a lay plan which can then be transmitted in the form of a control program to the automatic laying and cutting system. Alternatively, the patterns can be sent to a large plotting device where they will be drawn at full scale to serve as paper patterns for manual cutting. Darts: The purpose of dart is to eliminate excessive fabric in a pattern so that it can conform into the shape of a human body. Grain Line: Pattern pieces normally carry a line is called Grain line. Grain Line of pattern pieces usually is parallel to the warp (woven) or wale (knit). The actual direction depends on whether the pattern is to align with the warp, weft, wale or course when laid on the fabric for cutting. The direction of the grain line is therefore determined by the designer. Drill Holes: Drill holes are small holes drilled into pattern to indicate where other components (such as pockets) should be superimposed. Notches: Notches are cut into the pattern to indicate points where garment components that are to be joined together.